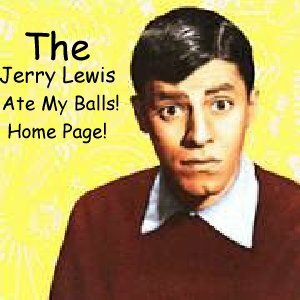 Please read this informative Biography (which I certainly did not write) About Jerry Lewis, or just take a nice nap while the Images Are Loading! Jerry Lewis was born Joseph Levitch on March 16, 1926, in Newark, New Jersey. His parents, Rae and Danny Lewis, were professionals in the entertainment world. While his father, as Jerry puts it, "was the total entertainer," his mother played piano at New York City radio station WOR, made musical arrangements, and was her husband's musical director. When only five years old Jerry made his debut at a hotel in New York's Borscht Circuit singing "Brother, Can You Spare A Dime?" By the time he was fifteen, he had perfected a comic routine, miming and silently mouthing lyrics of operatic and popular songs to a phonograph located off-stage. Dressed in a drape jacket and pegged pants, Jerry braved the offices of booking agents. When he finally got a booking it was at a burlesque house in Buffalo, but this hardly proved to be his big break... ready to give up in discouragement, he was advised to continue his career by a veteran burlesque comedian, Max Coleman, who had worked with Jerry's father years before. When Lewis tried out his mime act at Brown's Hotel in Loch Sheldrake, New York, the following summer... the audience was so enthusiastic that Irving Kaye, a Borscht Circuit comedian, helped the youth get further bookings. When the motion picture producer Hal Wallis watched the two perform at the Copacabana in New York City, he had them sign a contract with Paramount Pictures. Of their first film, "My Friend Irma" (1949), Bosley Crowther of the New York Times wrote: "We could go along with the laughs which were fetched by a new mad comedian, Jerry Lewis by name. This freakishly built and acting young man, who has been seen in nightclubs hereabouts with a collar-ad partner, Dean Martin, has a genuine comic quality. The swift eccentricity of his movements, the harrowing features of his face, and the squeak of his vocal protestations... have flair. His idiocy constitutes the burlesque of an idiot, which is something else again. He's the funniest thing in the picture." For ten years Martin and Lewis sandwiched sixteen money making films between nightclub engagements, personal appearances and television bookings. Their last film together was "Hollywood or Bust" (1956). On July 25th of that year the two made their last nightclub appearance together at the Copa, exactly ten years to the day since they had begun as a team. From then on, Jerry Lewis was constantly on the move. He recorded several records and albums; one of them "Rock-A-Bye Your Baby", released by Decca Records, has sold nearly four million copies to date. With increased confidence, Lewis plunged into screen writing, directing, producing as well as acting. In the spring of 1959, a contract between Paramount Pictures and Jerry Lewis Productions was signed specifying a payment of $10 million plus 60% of the profits for 14 films over a seven year period... at that time the biggest single transaction in film history for the exclusive services of one star. Paramount and Jerry dissolved the partnership in 1965. Jerry immediately moved to Columbia Pictures where he produced, directed and starred in "Three On A Couch"... he then wrote, produced, directed and starred in "The Big Mouth" and "Don't Raise the Bridge, Lower the River." He then directed Peter Lawford and Sammy Davis, Jr. in "One More Time" in England for United Artists before moving to Warner Bros. to star, produce and direct "Which Way To The Front?". The Times of London stated: "Quite apart from his gifts as a performer, Mr. Lewis is one of the best directors working in America today." Although Lewis is gratified by such esteem, he values the words engraved on a plaque in his dressing room more... the plaque was given to him by his friend, President John F. Kennedy, and reads: "There are three things that are real... God, human folly and laughter. Since the first two are beyond our comprehension, we must do the best we can with the third." Over the years Jerry Lewis scored triumphs in stage appearances in Europe, where he has been hailed as one of the greatest comedians of the 20th Century. When he played at the Olympia Theatre in Paris, tickets were sold out, the audience packed. "Jerry Lewis is more than a great artist, he is a great man," stated L'Aurore. 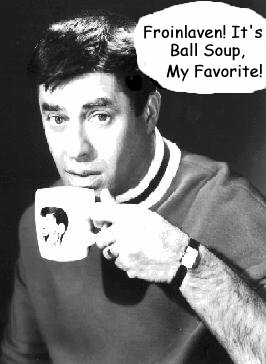 "Jerry Lewis is a man for all seasons, all people and all times. His name has, in the hearts of millions, become synonymous with peace, love and brotherhood." With those words, Congressman Les Aspin of Wisconsin concluded his nomination of Jerry Lewis for the Nobel Peace Prize in 1977. Jerry is the only entertainer in history to be so honored. In addition to his Nobel Peace Prize nomination and his induction to the Legion of Honor... Jerry has received many other honors... in 1971 the AFL-CIO presented him with the Murray-Green Award for Community Services, the highest honor the labor organization can bestow upon an American citizen. In September 1976 the United States Senate unanimously adopted a resolution of appreciation to him "For his outstanding contribution in the fight against muscular dystrophy." In June 1978 the communications industry honored him with the NATPE (National Association of Television Program Executives) Award of the Year for his humanitarian efforts in raising funds to combat neuromuscular disease through his annual Labor Day Telethon. In January 1980, the Touchdown Club of Washington, D. C. honored him with its prestigious Hubert H. Humphrey Humanitarian Award. This award is given annually to an individual who best exemplifies the ideals and courage of the late senator. Jerry received the Boston University School of Law's prestigious No Neal Pike Prize for Service to the Handicapped in November:, 1984. The award, which was presented by Boston University President John B. Silber, "recognizes individuals who have made special contributions that have improved the lives of people with disabilities." In 1984 Jerry was inducted into the French Legion of Honor by presidential decree. Legion membership honors individuals whose accomplishment demonstrate extraordinary public service. Several months before Jerry was made a Commander in the Order of Arts and Letters he was extolled by French Minister of Culture Jack Lang, for his "human qualities and generosity. You are a child's friend and a model for adults." In June, 1985, the Department of Defense presented him with the highest award it can bestow upon a civilian... the Department of Defense Medal for Distinguished Public Service. In June, 1987, Jerry was further honored when he received a Doctor of Humane Letters Degree from Mercy College, headquartered in Westchester, New York. Jerry, who gave the commencement address at the graduation ceremony, was described by Mercy College President Wilbur J. LeMelle as a "shining example for people everywhere that one person can have an impact on society and change the world." Jerry is a full professor at the University of Southern California, where he taught graduate students a course in film direction. "The Total Film-Maker", based on recordings of 480 hours of his classroom lectures, was edited by Jerry and published by Random House in 1971. Between films, the versatile and dynamic Lewis also found time to put pen to paper to produce his autobiography, "Jerry Lewis, In Person", a revealing portrait of the on and off-screen man, written in conjunction with author Herb Gluck. *Closed circuit television applied to motion pictures. *Created and devised by Jerry Lewis. *Engineered and perfected by the Paramount Technical Departments under the supervision of Bruce Denny. *Jerry Lewis began his research and development on the television assist in September 1956. One of the most successful performers in show business, box office gross receipts of his films total about $800 million. Lewis has received worldwide acclaim for his verve, style and personality. He has a fine feel for comic rhythm and possesses the unique qualities of a great clown. Critic Harriet Van Horne has called Lewis' screen image a "sort of witless genius", and Hollywood director Leo McCarey has described Lewis as the "Pied Piper of the business, the heir to the mantle of Charlie Chaplin and Harold Lloyd." Director Martin Scorcese's "The King of Comedy" stars Jerry as a talk show host with co-star Robert DeNiro. "Cracking Up" (AKA "Smorgasbord") released in 1983, employs the comedian's talent as writer, director and actor. He has starred in "To Catch A Cop" and "How Did You Get In?" filmed in Europe... he also starred in the ABC made-for-television movie, "Fight For Life", and in five episodes of the CBS-TV series "Wiseguy." In 1990 Jerry was asked to write and direct a segment on children's rights for UNICEF... which he did, and it is now being shown world-wide. In l991 he starred in "Arrowtooth Waltz" with co-stars Johnny Depp and Faye Dunaway. On Sunday, January 13, 1991, Jerry was surprised by the Cable Academy when they presented him with the Comic Life Achievement Award (the "ACE" award, presented to him by Whoopi Goldberg) at the Wiltern Theatre in Los Angeles;.. simultaneously, the broadcast was carried by 8 cable stations around the world. On April 17, 1991, he was inducted into the Broadcast Hall of Fame by the NAB (National Association of Broadcasters) convention at the Hilton Hotel in Las Vegas, Nevada. One dream of Jerry's has always been to play on Broadway... that dream came true! He starred in "Damn Yankees" at the Marquis Theatre in New York City... 185 performances!! He started the National Tour of "Damn Yankees" after Telethon '95. In late September '96 to August '97 the second U.S. tour is completed... again with a shut down for Telethon '97. From September '97 through August '98 Jerry takes "Damn Yankees" on the third year of the National Tour... with "time out" for Telethon '98! October '98 is the target date for opening the London run for one year... then on to Paris and Berlin! The making of the film "Damn Yankees" is in the talking stages right now. Mitchell Maxwell and Jerry are discussing the possibility of taking the show to Japan, Australia and New Zealand... Jerry could be 78 years old when this show wraps!! Whatever Jerry's commitments are... they always include "shutting down the show" for the Telethon of the Year!! Wasn't That A Nice Story? Ok, now (finally) On to the Ball Eating! Jerry's Natural Obsession Can Be Seen In These Early Black And White Photos! Jerry Eventually Gave Up Eating Balls, And started on cigarettes. 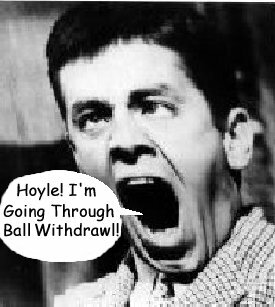 The Urge to eat balls was stronger than he could possibly assume, and soon he had to have more! Since then, Jerry has gotten help from his friends, but still gets the overwhelming need to eat balls.